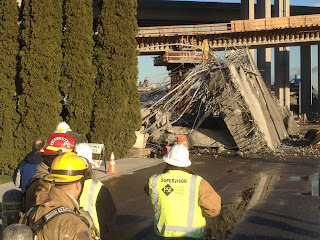 Narrative: At 1:48 p.m. Tacoma Firefighters responded to a reported construction accident on the State Route 16 construction project. 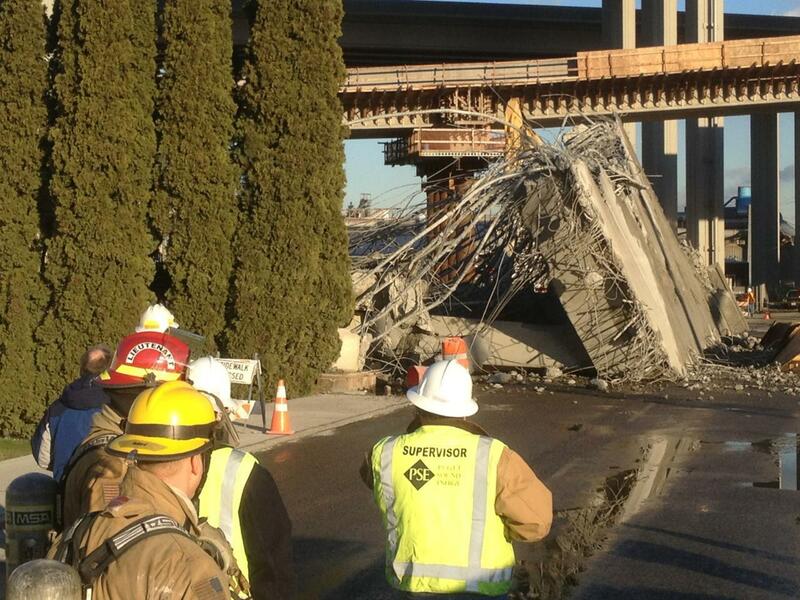 Crews arrived to find a large section of the old overpass had fallen on South Tacoma Way during the demolition process. The debris damaged underground utilities including a water main, and natural gas line. South Tacoma Way remains closed until the piece can be removed, and utility repairs completed. Narrative: At 7:49 am Tacoma firefighters responded to a reported house fire less than two blocks from Station 13. The first fire engine and battalion chief, traveling from Station 9, arrived at the scene at 7:53 and reported that smoke and flames were showing from the one-story residence. Ladder 3, also traveling from Station 9, arrived at 7:54. Crews entered the house and attacked the fire, confining it to the room of origin. The crew from the newly established Squad 13 searched the interior of house. Two occupants were home at the time of the fire and escaped without harm, and there were no injuries to report. The cause of the fire was a failure of the homes knob and tube electrical wiring, resulting in an estimated $15,000 damage to the building and its contents. The house fire occurred within the first hour of the Tacoma Fire Department’s new modified deployment model, which was adopted as part of the City's 2013-14 biennium budget. Narrative: At 3:10 p.m., Tacoma Firefighters responded to a reported commercial structure fire in a cabinet manufacturing business. Crews arrived to find fire coming from a large section of ductwork for the buildings dust collection system. Crews isolated the area of fire in the conveyance ducts using thermal imaging cameras, took sections apart, and used Class A Foam to extinguish the fire in the ducts and the systems hopper area. UPDATE: The cause of the fire was embers from a bandsaw that ignited the wood products in the ducts and hopper, resulting in an estimated $35,000 dollars damage to the building and its contents.